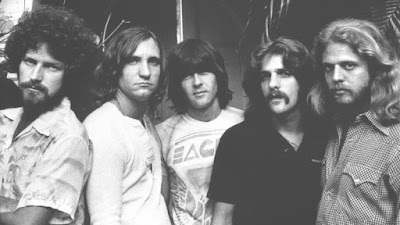 The Eagles are streaming audio of a previously-unreleased 1976 live recording of “Hotel California” as a preview to the November 24 release of a series of expanded 40th anniversary editions of their 1976 album classic. One of the first-ever live performances of the iconic song is one of ten live tracks on a bonus disc in the forthcoming 2017 package that were recorded during the band’s three-night stand at the Los Angeles Forum in October 1976, about a month before the album hit stores. Alongside the live audio, the 2-CD/1-Blu-ray Audio “Hotel California: 40th Anniversary Deluxe Edition” includes remastered sound as well as hi-res stereo and 5.1 mixes. Presented in an 11 x 11 hardbound book, the set also features rare and unseen photos, a replica tour book, and an 11 x 22 poster. The 40th anniversary set will also be available as a 2CD Expanded Edition and a single CD package, alongside digital download and streaming versions. The Eagles are currently playing a short series of fall US dates with their new live lineup: joining Don Henley, Joe Walsh and Timothy B. Schmit are the late Glenn Frey’s son, Deacon, and country singer Vince Gill; band co-founder Glenn Frey passed away in 2016.